ARE BASSETS A SMALL BREED? No, not at all. Basset hounds are technically considered a medium-sized breed, with the average weight between 45 and 65 lbs. 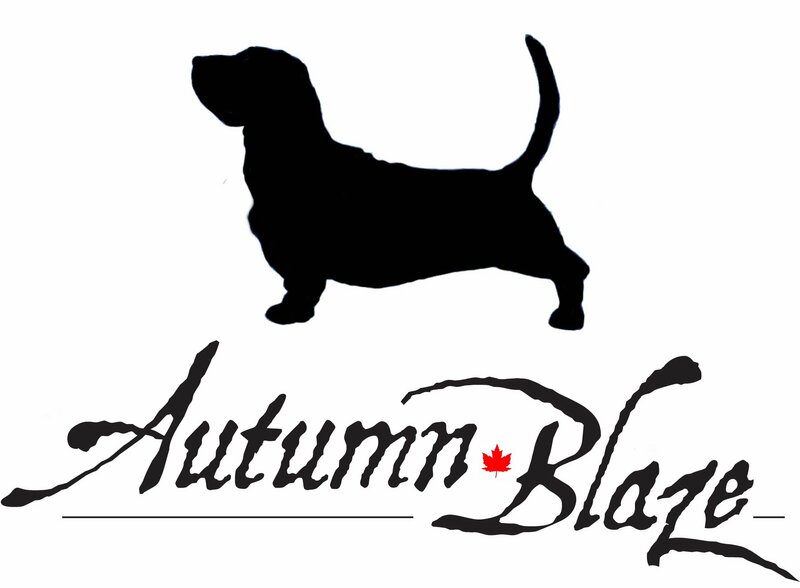 Some bassets, however can weigh up to 100 lbs ( although here at Autumn Blaze, we do not breed bassets that big ). Most males weigh between 50-70 lbs, with the females weighing between 45-60lbs. Bassets are generally not taller than 15" in height, which leads to the idea that they are a small breed. Some bassets like nothing more than to sleep on the couch all day, but they are the exception. Most Bassets are active dogs that will get into trouble regularly. They love to play, and will stash toys all over your house and yard. Some bassets are chewers and can be destructive. Food, paper and garbage cans are all temptations not only to the basset hound, but to most dogs. Bassets love to go for regular walks with their owners and are very social dogs. Be forewarned, however, that basset hounds are not the best dogs to let off lead. They will follow their noses, and can often wander off and get lost. DO BASSET HOUNDS SHED AND DROOL? Yes, on both accounts! Even thought the basset has short hair, they do shed ALOT. Regular brushing with a "hound mitt" can help, but you will still need a good vacuum cleaner :) It is always a good idea to regular routine of brushing their hair, clipping their nails and cleaning their ears at least once a week. Basset Hounds can fling their drool everywhere imaginable. Males tend to drool more than the females, and both will drool more when excited or upset. Always have a drool towel handy wherever you go. DO BASSETS GET ALONG WITH KIDS AND OTHER DOGS? Because bassets do not typically excel in obedience, they are sometimes considered less intelligent than other breeds. They are actually highly intelligent, but they possess an independent nature and a low desire to please their owners. In plain english, bassets can be VERY STUBBORN. This can be frustrating when it comes to house training, but persistance WILL pay off. Many basset owners have said that the installment of a dog door to the back yard was the easiest way to train their basset hound. EAR INFECTIONS - All floppy eared dogs are prone to ear infections because air does not circulate and dry the ears on a regular basis. It is very important to keep your bassets ears clean and dry. HOT SPOTS - Because of the many folds in your bassets skin, moisture can get in between the folds of skin and cause irritation that can lead to a bacterial skin infection. A quick check of your dogs folds can prevent this from occurring. GLAUCOMA - This is a condition where the pressure of the fluid in the eye increases until the sight is gone in that eye. Basset Hounds are predisposed to this condition (although I have never had this occur in any of my bassets) and must be watched carefully. Glaucoma can be corrected if caught early. PANEOSTETIS - This is also known as "growing pains" or "pano". It occurs as a rotating lameness, usually in pups up to 18 months. One day you may see that your pup is limping on their back left leg, and two days later, they may be limping on their right. Crate rest usually is all that is needed for complete recovery, but you may want to pick up some meds from your vet to ease the pain. This doesn't happen in all bassets mind you, but just be aware of this. BLOAT - Bloat occurs in deep-chested breeds such as basset hounds and labradors. It is a torsioning of the stomach and is very life threatening. It can happen after eating a large meal and then running or playing heavily. Letting a dog rest after eating can help prevent this from occuring. We free-feed our bassets to help decrease the risk of Bloat. CHERRY EYE - is caused by the prolapse of the tear gland of the third eyelid. The exact cause is unknown. Some breeds are just more prone to this condition.